How long have you had the pain in your knee? Have you had recurring knee pain? In addition this information along with an examination will help us to diagnose where the pain is stemming from, as it’s not always from the knee itself. Secondly, pain over the front of the knee is most commonly related to the area around the kneecap, which can be caused by several different problems. It may be particularly sore when sitting for long periods such as driving or cycling. The patella, or kneecap, is one of three bones, along with the tibia (shin bone) and femur (thigh bone), that make up the knee joint. All of these bones are covered with a layer of cartilage at points where their surfaces come into contact. The patella is wrapped within a tendon. This tendon connects the quadriceps muscle of the thigh to the shin bone (tibia) below the knee joint. The patella is important functionally because it increases the leverage of the knee joint, which allows for an increase of about 30% in strength of extension (kicking) of the leg at the knee joint. The most common disorder is known as chondromalacia, often called Runner’s Knee. Chondromalacia occurs because of irritation of the cartilage on the undersurface of the kneecap. Gives rise to a lump that can be painful at the front of the knee on the tibia. Prepatellar bursitis, or Housemaid’s Knee Syndrome, is a condition of swelling and inflammation over the front of the knee. This is commonly seen in patients who kneel for extended periods, such as carpet layers and gardeners. Patients who experience this painful knee condition often have a patella that does not track evenly within its groove on the femur. When the kneecap comes completely out of its groove, the condition is called a patella dislocation. When the kneecap dislocates, it must be put back into its groove. Treatment of kneecap Problems depends on the diagnosis. However there are some general guidelines that can be followed. 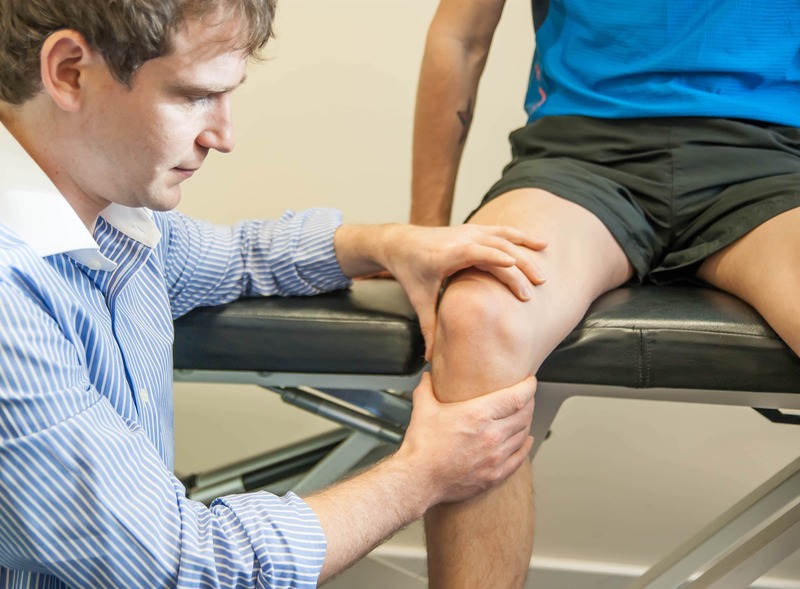 For more information, and for a diagnosis of your knee pain, it is important to see on of the Chiropractors at Tunbridge Wells Chiropractic Clinic. Other problems that can give rise to pain at the front of the knee are hip arthritis and pain radiating from a nerve root injury in the back. In addition it is therefore essential to correctly diagnose the cause of your pain before you embark on any treatment. Pain on the inside, or medial side, of the knee is commonly caused by a meniscus (often called cartilage) injury. There are two menisci in your knee; each rests between the thigh bone (femur) and shin bone (tibia). The menisci are made of tough cartilage and conform to the surfaces of the bones upon which they rest. One meniscus is on the inside of your knee; this is the medial meniscus. The other meniscus rests on the outside of your knee, the lateral meniscus. The meniscus functions to distribute your body weight across the knee joint. The two most common causes of a meniscus tear are due to traumatic sporting injury (often seen in athletes) and degenerative processes (seen in older patients who have more brittle cartilage). Not to mention the most common mechanism of a traumatic meniscus tear occurs when the knee joint is bent and the knee is then twisted. You will often experience pain and swelling and joint locking, or the inability to completely straighten the joint. This is due to a piece of the torn cartilage physically impinging the joint mechanism of the knee. You may feel soreness when you press on the meniscus. The knee may pop or click on movement and you may not be able to move the knee properly. Treatment of meniscus injuries depends on the severity of the injury. You may require surgery or rest and rehabilitation of the hip, foot and knee movement patterns and muscles may be sufficient to aid recovery. As a matter of fact pain on the outside of the knee, or lateral side, is commonly caused by lateral meniscus tears (which give similar symptoms to the medial meniscus but on the outside of the knee) and iliotibial band syndrome, or ITBS, which is due to inflammation of the iliotibial band, a thick band of fibrous tissue that runs down the outside of the leg. The iliotibial band begins at the hip and extends to the outer side of the shin bone (tibia) just below the knee joint. The band functions in coordination with several of the hip and thigh muscles to provide stability to the outside of the knee joint. Common in cyclists Iliotibial band syndrome (ITBS) occurs when there is irritation to this band of fibrous tissue at the lateral epicondyle which is at the end of the femur (thigh) bone. The iliotibial band crosses bone and muscle at this point; between these structures is a bursa which should facilitate a smooth gliding motion. However, when inflamed, the iliotibial band does not glide easily, and pain associated with movement is the result. You may experience pain, swelling and a snapping sound when you bend the knee. Endurance athletes are especially prone to developing iliotibial band syndrome. In addition runners, cyclists, and other endurance athletes should find cross-training techniques that allow maintenance of their endurance without continuation of their discomfort. Treatment requires muscle rehabilitation that focuses on hip, foot and knee function, as the iliotibial band requires proper mechanics of all of these joints for normal function. Working with a chiropractor who will inform you of the appropriate exercises for your particular problem. Pain in the back of the knee can be due to the collection of fluid, called a Baker’s Cyst. The knee is stabilised by ligaments that connect the shin bone (tibia) to the thigh bone (femur). In addition the Knee may feel like it’s giving way when the ligaments are stretched or torn. Not to mention the knee may give way if you have arthritis. It may also give way if you have a lower back problem with sciatica. Knee mobility can be affected by a number of common conditions. In the same fashion if mobility is chronically limited, often the cause is arthritis. When the surface of the joint becomes irregular as a result of the arthritis, the mobility of the joint may become limited. You may also have a hamstring injury.